MOMI-fest beta 1.0 | Esc.rec. For some time now I’ve been working together with Peter Boorsma on the realization of MOMI-fest beta 1.0, a (free!) festival loosely based on MOMI with a touch of esc.rec. The line-up is complete now, so I’m very proud to present our official press release to you right here. Hope to see you all on the 1st of September! Saturday the 1st of September, music blog My Own Music Industry (MOMI) organizes her first concert night. The programme is a joint effort by MOMI (www.myownmusicindustry.nl) and esc.rec. (www.escrec.com). Thanks to the enthusiasm of all the bands and participants involved, the programme has become quite extensive, with a crammed line-up as the inevitable consequence. Therefore the programme starts at three in the afternoon and continues non-stop till midnight. MOMI-fest beta 1.0 mainly features a wide variety of MOMI and esc.rec. related music, but also presents design, photography and the interactive nature of a weblog in the shape of exhibitions, a lecture and interactive media. MOMI-fest beta 1.0 is a mini-festival within ‘Openingsfestival Havenkwartier Deventer’ (www.havenkwartier.org). Havenkwartier is a cluster of work spaces for artists and small creative companies in Deventer. It is meant to become a meeting place for creatives and businesses to form new networks and collaborations. Last year MOMI was winner of a Dutch Bloggie in the category Best Music Blog. MOMI is written by a broad variety of musicians, designers, (pop)photographers, bookers, music reviewers. In general MOMI writes about obscurities, strange phenomena and excesses within the ‘music industry’ combined with an emphasis on Dutch music. Esc.rec. is a record label and platform for new, unknown and experimental music. Besides releasing interesting music esc.rec. organizes events to stimulate collaborations between artists, labels, organizations, venues and distributors. Esc.rec. is also a participant in Het Havenkwartier. 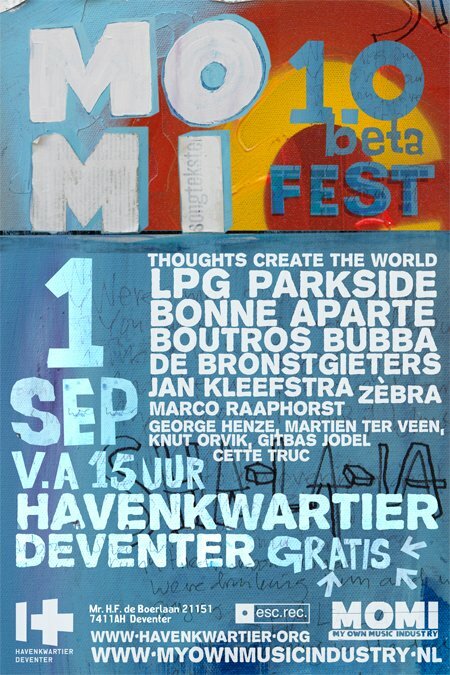 Line-up of MOMI-fest beta 1.0: LPG (music), Bonne Aparte (music), De Bronstgieters (music), Boutros Bubba (music), Parkside (music), Zèbra (music), Thoughts Create The World (music), Cette Truc (dj), George Henze (expo), Vormversterker (expo), Martien ter Veen (expo), Niet Voor Niets (expo), Marco Raaphorst (lecture), Jan Kleefstra (poetry). Check the latest addition to MOMI, the MOMI-fest blog (www.myownmusicindustry.nl/momifest.php) for any new info. Download the MOMI-fest poster overhere.